Through one of my companies we have become a member of the Bournemouth Air Festival Patrons Club. The donations goes towards the clubs activities, to the air festival and charitable contributions. I've been to two of their monthly events in the run up to the air festival. One was the ex-Red Arrows pilot Ben Murphy, who was Squadron Leader when disaster struck the festival in the tragic death of pilot Jon Egging, and another was a talk on Charles Rolls (one half of Rolls Royce) and how he took part in an air festival by Hengistbury Head and died in a crash there. All very interesting and I can't wait till we get a chance to get on board the large Navy vessel that overseas the air festival. Wow, the Bournemouth Echo did an interview with me and they've only gone and published it! Time passes by so quickly that I didn't realise that I have been down in Bournemouth for so long, over 21 years. We talked about what I used to do and what I do now. Compared to the huge number of digital startup companies around here, I do feel like a Digital Dinosaur. This is the longest I have lived in a single place, and do firmly call it home. Sake tasting for sake's sake. 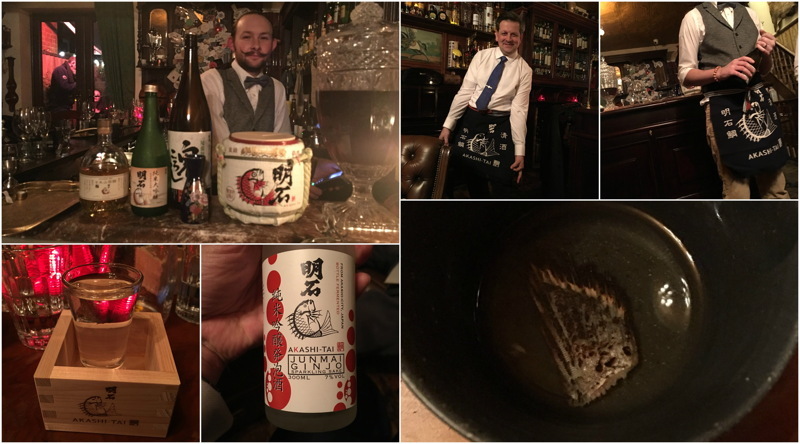 Dave Hall from the Larder House/Library of Liquor took us through a very interesting evening tasting different Japanese sake and learning about its background and the part that milling process plays. 7 sake were on offer and a couple of them had a little extra treatment to make them traditional and memorable, although for some it was a bit too much, ha ha. You shall see. All dressed up in Akashi Tai aprons Dave and Salvatore were ready to get the evening rolling, as opposed to getting down to some deep and dirty sumo wrestling. Dave began by giving some background to the brewing process and how sake is more akin to beer than wine. Many of the sake makers are small scale, and the product can be totally encompassing for the people working there, sleeping and waking to turn the rice over and so on on a regular basis. Amazing. Read more: Sake tasting for sake's sake. We are loving the real ale Micropub scene that is developing around Bournemouth, as it is around the country. We did a little mini-micropub crawl the other weekend and thoroughly enjoyed the venues and the chats with the owners and fellow drinkers alike. You can't really do that in other pubs as easily can you? Try that in 'Spoons or some high street pub and you will probably be met by a strange look. Starting off in Winton, we called into the Silverback Ale House - I tried a Porter and then a Blue Monkey 10.5% Russian Imperial Stout in a bottle. A short walk back down the High Street, during one of the worst stormy nights to hit England in 2016, we ended up in the Micro Moose (their Micro Moose Facebook page). A few more beers and chats with the locals. Had a great conversation with a gentleman at the bar, talking about all sorts of stuff, including hats, neckties, Strictly and more. I'm sure we both enjoyed the ramblings and I left him with a nice cigar for his time! Next it was a taxi ride to the Saxon Bear in Christchurch. By that time, I "barely" had room for one more and just sipped away whilst enjoying the fun and laughter. 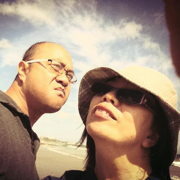 A fantastic afternoon to early evening outing for sure, and fully recommended. 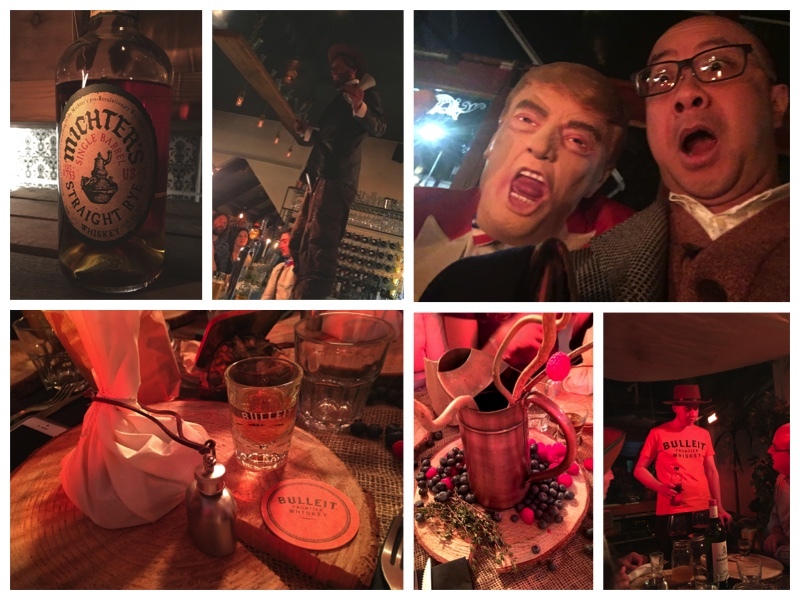 It was American Whiskey theme night over at the Larder House this time (11 Nov 2016). No major structural fabrications this time like there was for the World of Whiskey or the Rum nights, but the fun and games were still there in spades. On entry, we were actually entering an old Cowboy Saloon to be met by a shot of Rittenhouse Rye whiskey to chased by a shot of pickle juice, a pairing called a Pickleback. Slightly acquired taste but at least I know the leftover pickle juice from those jars have another use. Something oddball to try with your next set of dinner guests methinks. Whilst the Cowboy Saloon music played on, we were treated to a couple of mixed cocktails in the form of a mint julep made with Evan Williams Extra (a Bourbon), and also a Mellow Corn Blinker (a whiskey made from corn). OK, the night is getting interesting. With all this alcohol flying around the platters of chicken wings, cured salmon and frickles (fried pickles for the vegetarians) came out at the right time.